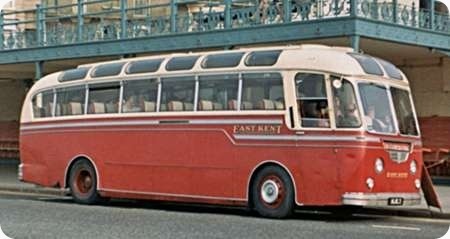 Dennis Lancet I, chassis number 171027, was bodied by Willowbrook (2830) and seated thirty-seven passengers. 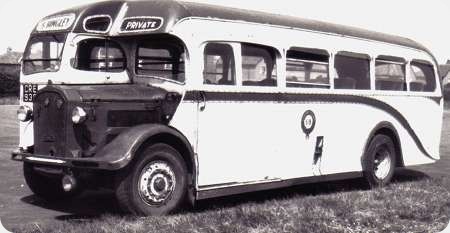 It was new in 1935 and was operated by Associated Bus Companies Ltd (formed in 1928 of several local independents) prior to the acquisition of that company by Potteries Motor Traction in 1944. PMT withdrew it from service in 1946 and in April that year it was with S.Bingley, Hemsworth, eventually scrapped by Crossroads Commercials of Leeds in May 1956. Did S Bingley have any connection with W R & P Bingley of United Services? Given that the most common capacities of the time seem to have been 33 seats in coaches and 35 in single deck buses, 37 coach seats must have been very cramped! These Lancet I’s suffered from very heavy-looking radiator shells, unlike the equivalent 1935 Lance rads. It rather spolit the look of them. Perhaps the cramped seating was one reason why Potteries withdrew an eleven year-old vehicle at a time of severe post-war vehicle shortages? The driving cab also looks very fore-shortened leaving the front of the bonnet some way ahead of it. I, too, am surprised by the large seating capacity. The Lancet I, which appeared on the market in 1931, had a very bulky and deep radiator shell that was shared by the heavier Dennis haulage models of that time, and the cab front was set behind this cowl. The front wings were swept forward in a manner later adopted by wartime Guy Arabs, and these ‘extensions’ were joined across the front by a kind of bumper bar. All this space inefficient front end had to be accommodated within the overall length of 27ft 6ins, which did not allow for a great capacity within the rest of the bodywork. The later Lancet II of 1935 remedied this shortcoming by having a very slim radiator shell mounted at the extreme front, and this was offset to the nearside to maximise driving cab space. Lancet IIs could be fitted with bodywork seating up to 39 passengers. The Lancet I and II were powered by the Dennis 6.79 litre ‘Big Four’ petrol engine that could be rated up to 97 bhp, a very compact and reliable design employing wet cylinder liners. Versions fitted with the ‘O’ type five speed gearbox could attain 58 mph, so the petrol Lancet was no sluggard. From 1934 the advanced O4 diesel was offered as an option in the Lancet II. I’d noticed to ‘Guy’ likeness to the wings, myself, Roger. Pre-war wet-liner engines never seemed to suffer from the same problems as post-war ones did. You’re referring to the AEC wet liner debacle, Chris. AEC never did solve its wet liner problems, but the responsibility lay with the Southall firm, not with the wet liner concept. Dennis were engineers of a very high order, and knew how to get it right. The post war Dennis O6 diesel, like the earlier O4, was a wet liner engine with the timing gears situated at the rear of the crankcase, yet both of these design features were regarded with disfavour in some quarters following the shortcomings of AEC (wet liners) and Daimler and Meadows (rear timing gears). The Dennis O4 and O6 also employed four valves per cylinder, the only British production engines to be so equipped. The O6 was an outstanding engine, and installed in the Lancet III, was taken up enthusiastically by many small independent operators who valued its total dependability, notwithstanding its advanced specification. Amazing that AEC never cured the liner problem. Renault cars in the 60/70’s had wet liners and I had two cars with them, as did a friend. They were no problem, but the timing chains were another thing. Poor tensioners and these were rear engines put at the front, so that the timing chains were then at the back. My friend with a Renault 16 cut a hole in the front bulkhead to sort out his, then put a plate back over the hole! Post-war Daimler bus also had rear timing chains, difficult to access without removing the engine. The few D’s with them were removed and replaced by surplus AEC 7.7’s within five years. Pemberton who were based at Upton nr Pontefract I think were absorbed into Welsh’s Coaches who operate from the same depot. Thanks for that link Brian. I guess there was no existing family link or Pembertons would not have got a foot in the door in the first place. Further to Chris Hebbron’s reference to timing chains at the rear of the Daimler CD6 and CD650 engines, that’s not the case, like the Dennis O6 and I believe the Meadows 6DC630 the timing was supplied by a gear train, there is further detail in ‘A Further Look At Buses’ by G. G.Hillditch. Gardner’s 15.5 litre 6LYT engine broke new ground for the Company in having a rear-mounted timing gear train, rather than Gardner’s traditional triplex timing chain mounted at the front. The Leyland 500-Series engines as fitted to the Leyland National I, New Zealand Bristol RELLs and quite a number of Bristol VRT3s also had rear-mounted timing gear trains. The preserved Smith’s of Westoning Lancet is now fitted with an electric starter. My 1935 ex-Southern Vectis one was always fitted with a starter but one should not over-estimate their effectiveness. They would start a vehicle with a warm engine, maybe even one that had had been garaged overnight, but were never suitable for a completely cold start. For that you needed somebody in the cab and somebody helping on the handle. I have seen other marques of vehicle that were similar. For the record there is of course no such thing as a "Lancet 1" – in their time they were just "Lancet". The assumed designation only came about when the Mk2 arrived. Yes, the original Lancet was just that, like the original Arab, Regent and Regal, and, in the private car world, the Cortina amongst many others. The retrospective application of the appellation ‘1’ or ‘Mark 1’ does clarify the model being discussed. I suppose that, if one wished to be totally accurate, the term ‘1935 Lancet’ should be employed here, but that wouldn’t work either because the Lancet II came out in that same year. Adopting the form Lancet (1), Regal (1) etc seems unnecessarily pedantic to my mind. I should think that only in the military aircraft field would ‘Mark 1’ be used from the start, and then not always. This photo taken on Margate seafront in about 1966 shows HJG 3 numerically the first of a batch of 30 Dennis Lancet UF’s fitted with Duple Ambassador C41C bodies delivered to East Kent in 1954 these made up the largest fleet of Lancet UF’s in the country. Looking at this photo again recently I thought how the elegant simplicity of both the coachwork and the superb East Kent livery set one another off beautifully, on the Lancet the windscreens were set lower than on the contemporary Royal Tiger’s and Regal IV’s due to the Lancet’s lower driving position which also made the skylights above the screens more upright also the cab windows and the pillar behind the cab was a different shape. I feel that the Lancet UF deserved more success than it achieved but obviously it did not appeal to those then all powerful figures the Fleet Engineers who didn’t like some aspects of the specification. Rather like Leyland in the dark, dark days of British Leyland you feel in your guts that you ought to, that you want to like/support Dennis. Many the reputable operator ran Lances, Lancet(tte)s and, of course, Lolines. Glenton ran the last "batch" of Lancet UFs with Plaxton Panorama bodywork – another class act. Often, specifications were good – just quirky and unproven (not necessarily bad and unreliable). Fodens had this problem. I’m no great lover of the Javelin – I prefer heavyweights – but it was a solid workhorse in the style of Bedford and Ford. I did, however, take a Dennis R420 to the South of France one summer. With its ZF AStronic gearbox (and a bit of imagination!) you could call it a cheap GB Setra. Being very much a Setra man, I can say that the R420 was one of the best/nicest coaches I have ever driven. It never took off because it didn’t have Volvo Assist to back it up if it broke down. [My experience of Volvo Assist is that it wasn’t missing much.] So I can support Roger to the hilt. The R series should have been a success, it wasn’t Dennis’s fault it wasn’t – and I’m sure the same was true of the Lancet UF. 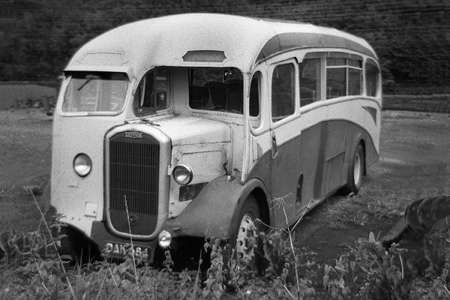 Newport Corporation ran some Lancet UFs but most were bodied as coaches, weren’t they? Newport Corporation took 12 Lancet UF in two batches. In his book "Dennis Buses in Camera" Robin Hannay says that the first 4 had bus bodies but makes no comment about the second batch although in the picture it appears that they have bus seating. All bodies were built by D J Davies a local coach operator and Dennis agent. Paragon – thanks, I meant to say "most others", i.e. other than Newport’s. I know there’s a preserved Brutonian vehicle and Aldershot & District had at least one with a bus body. As has been stated elsewhere on this site, Dennis Lancet UF KOT 600 was never owned by Aldershot and District. The confusion arises because the vehicle was painted in A&D livery and given the fleet number 187, but it remained the property of the manufacturer. It was operated on hire from Dennis from 1st February to 30 November 1953, after which it was returned to the Guildford factory. It subsequently went to Simmonds of Great Gonerby, near Grantham, and then to Cullings of Norwich who eventually passed it on to Blue Bus of Slough. At some stage in its life its Strachans B41R body was rebuilt with a front entrance. Aldershot and District went over to the AEC Reliance for its single deck requirements. "Somerset’s Buses" by Laurie James (Tempus 2004) is the source of much useful information concerning the Lancet UFs belonging to Hutchings and Cornelius of which the Brutonian example mentioned above is one. H&C were Dennis users for many years and in 1957 took 3 UFs YYB 117/8/9.117 was DP40F and the other 2 were B42F. All had full service lives. 118 ended up with Brutonian but the interesting thing is that 119 is shown as passing to a Preservation Group in Guildford in September 1973. Where is it now? I had a close relationship with the East Kent UFs when they were used on contract services at Dover Eastern Docks providing a road link from ships and hovercraft to Dover Priory railway station in the 1969 -1971 period. I can vouch for what Roger Cox says about the potential difficulties posed by the remote gearbox, the long linkages and the unconventional gate. I can remember even experienced drivers stirring the long gear lever to find what they were looking for. In spite of being in their late teens at the end at the time they presented a modern image alongside the new hovercraft, and dare I say it they were more reliable than an SRN4! Just worth noting that the East Kent fleet was HJG 3 – HJG 32, slightly different from the numbers in Roger’s comment. Roger – When I was young, about four times a year, I’d get an A&D Lance from Woking to St. Peter’s Hospital, near Chertsey and would try and sit in the nearside/offside downstairs front seat and observe the driver. It was quite some time before I worked out how that Dennis ‘O’ gearbox worked and the strange ‘U’ movement by the driver, with no change in engine note at that moment. I was quite used to preselective methods with the LTE Daimlers around Morden, but a crash gearbox with pre-selective overdrive; egad; that was quite another thing! That whole area was also interesting in that you would have London Country and A&D buses popping in and out of turnings all over. Interesting times. Paragon enquires what became of YYB 119 once listed as preserved? A previous owner of now preserved YYB 118 told me that circa 1984 he had located 119 laid up behind a pub in the Guildford area. Photographs show that it was in fairly poor order, blocked up with a missing front wheel and a large pile of scaffolding stacked against one side. Despite enquiries no one could be found who knew anything about it and when he returned at a later date it had gone. And as far as I am aware, it has never been seen since. Attemps to trace members of "The Guildford LU2 Group" have been equally negative. Chris, the Lance K3 was a remarkable machine, with its free running 7.58 litre 24 valve O6 engine, giving (unlike the optimistic claims of contemporary Crossley and Daimler engines, both of which had a litre greater capacity) a genuine 100 bhp, and this was coupled to the ‘O’ type gearbox with its preselective overdrive fifth gear. It was probably the fastest double decker of its time. In an age when the legal maximum speed for a psv was 30 mph, it always amused me to read the plate on the internal cab bonnet side of the Aldershot and District Lances and Lancets – "Do not engage fifth gear below 30 mph". In my own experience, sadly only as a passenger, the drivers certainly complied, and these machines spent much of their time in overdrive. To the best of my knowledge, the A&D timetables of the 1960s did not differ greatly in terms of running time from those of the late 1950s. One had to drive a Loline pretty hard to get to Petersfield on time from Guildford or Aldershot, so the old 30mph limit must have been regularly observed in the breach. About,1963 I took a return journey from Portsmouth to Milford, swapping from Southdown to A&D at Petersfield. The Southdown, from memory, was one of the East Lancs PD2/12 registration RUF ###’s, but the A&D was a Loline; interesting, but not a Lance, to my eternal regret Roger, on that challenging route. It’s confession time – I was the "Guildford LU2 Group" After my initial attempt at vehicle preservation (OWB GCV 623) failed with the vehicle being vandalised on a farm in Elstead, I tried again with YYB 119 which I bought directly from H & C and drove home. Sadly, after securing a parking space next to a pub in Witley, I tried to get an MOT and needed to replace the kingpins, something which I was unable to do. Having run out of money and enthusiasm, I am ashamed to say that the bus was abandoned and I suspect that the kindly publican probably sold it for scrap. My next foray into bus ownership was the purchase of VCH 172 from Tillingbourne which I operated as KRC Coaches (Later to become Surreyways).